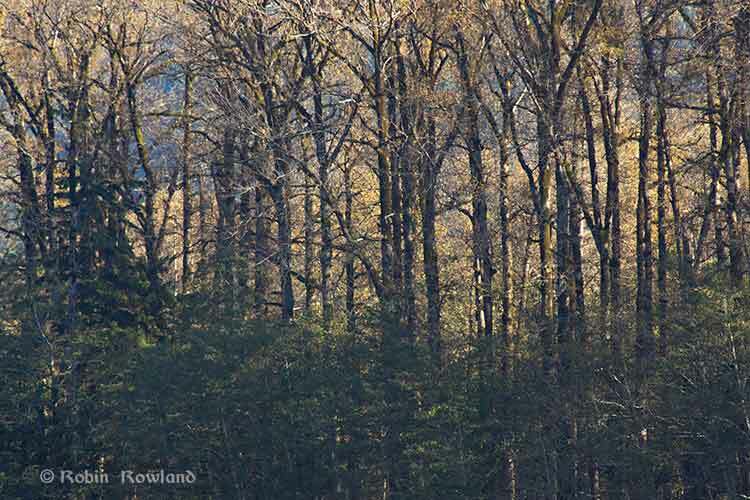 I had great plans for shooting the super moon and the eclipse blood moon on Sunday night, September 27. Unfortunately the ideal shot of the moon rising over our iconic Mt. Elizabeth (which I have captured in the past) was impossible, there was a storm blowing in, and the overcast was so heavy that dark moon wasn’t even visible. 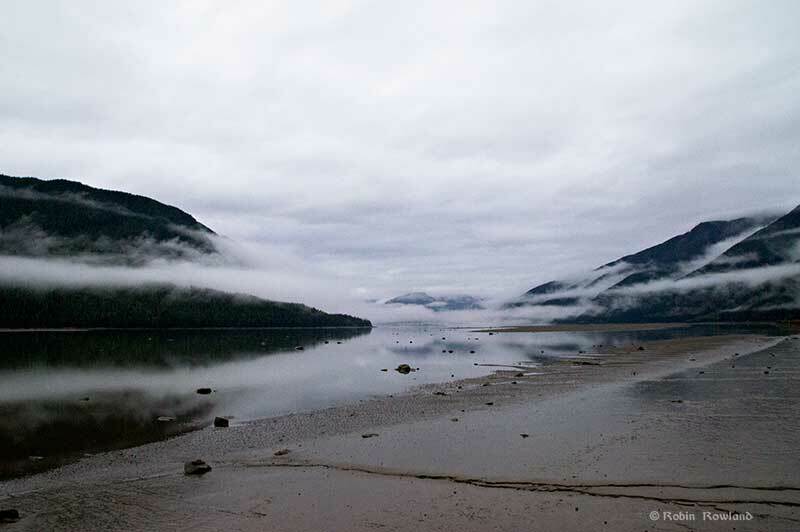 I was amazed at the Skeena was so flat, and so low at a time when it had been raining for the past couple of days and should have been much higher. 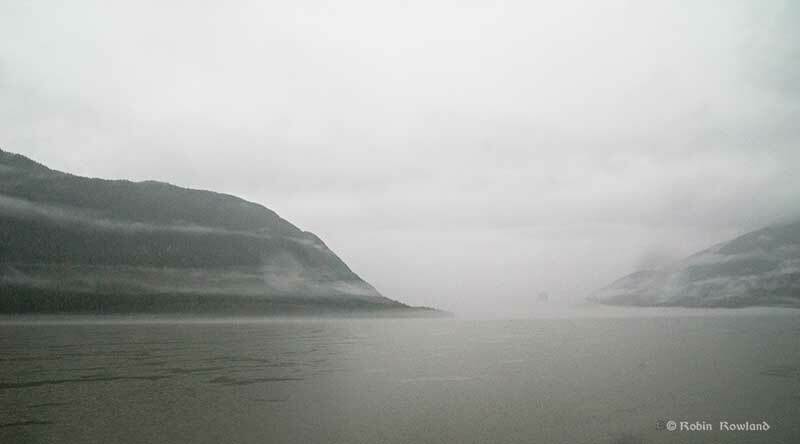 A few hours later when I was driving back from Prince Rupert, in a pounding rain and wind storm, the river was actually higher than I had ever seen it before. I didn’t realize what I had until I was watching the weather segment on the CBC National, and the Weather Network presenter mentioned there was a super tide. Google checks confirmed that a super tide accompanies a super moon. 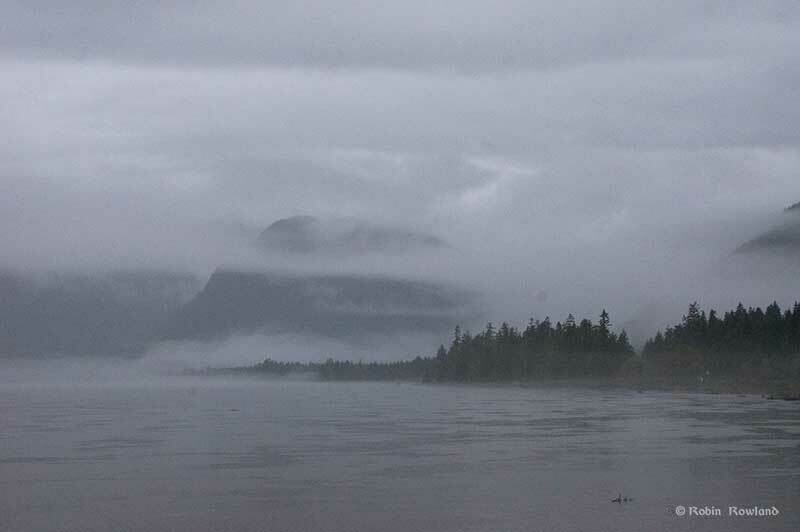 Telegraph Point, on the Skeena, taken at 1135 hrs on September 28. 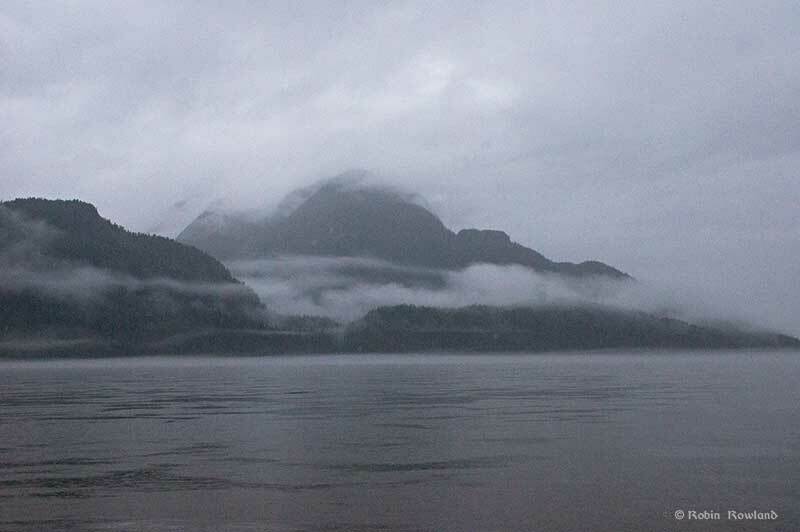 As I arrived for an appointment in Prince Rupert, it started to rain. By the time I had completed my appointment and had had lunch, I drove back in a wind driver rain storm. I stopped briefly at Telegraph Point and grabbed some quick shots. 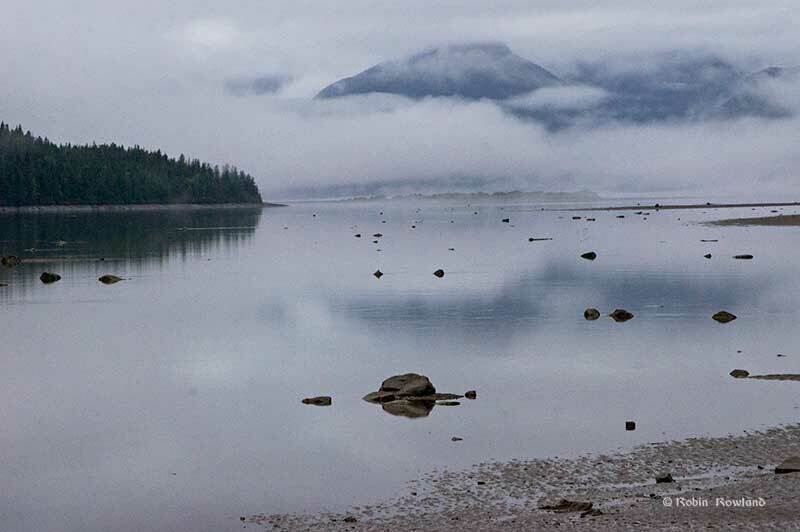 This shot, roughly the same angle as the first low tide shot, was taken at 1457, just after high tide at Prince Rupert at 1426. You can’t see it in a still image, but in the river the water was moving rapidly upstream. This was taken at 1512 from the same spot as the first low tide shot. Another angle from Telegraph Point taken during the storm at 1512. 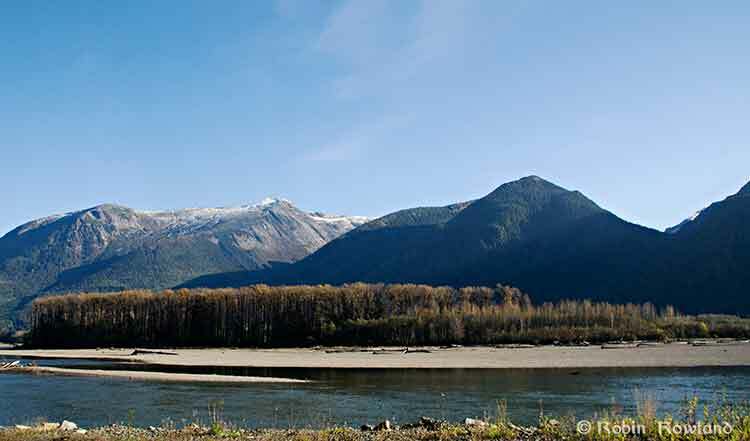 Shots of fall colors along the Skeena, October 16, 2014. 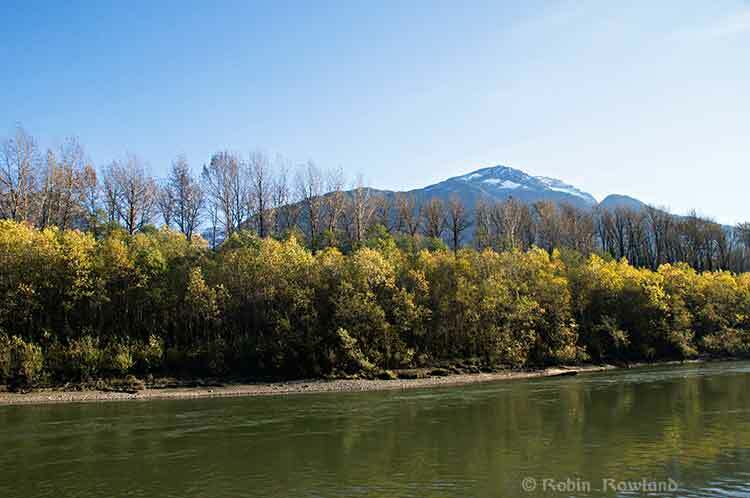 The falls colours along the Skeena can be fleeting. 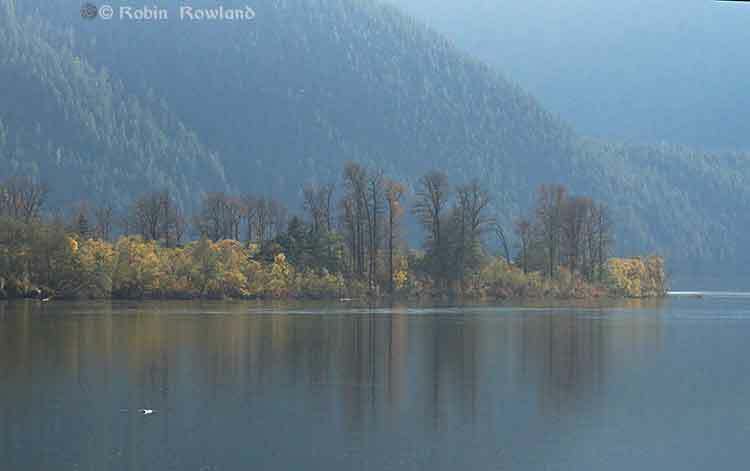 For a while the cottonwoods are changing, while the alders remain green or begin to change to yellow. 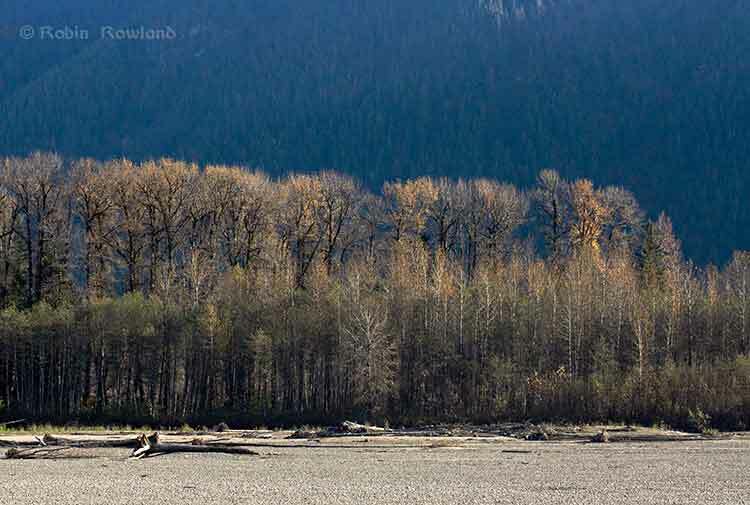 A few days later, the time I drove along the Skeena in the middle of October 2013, the tall black cottonwoods have quickly lost their leaves, while the alders (and occasionally birch) along the river banks shine bright yellow in the afternoon sun. 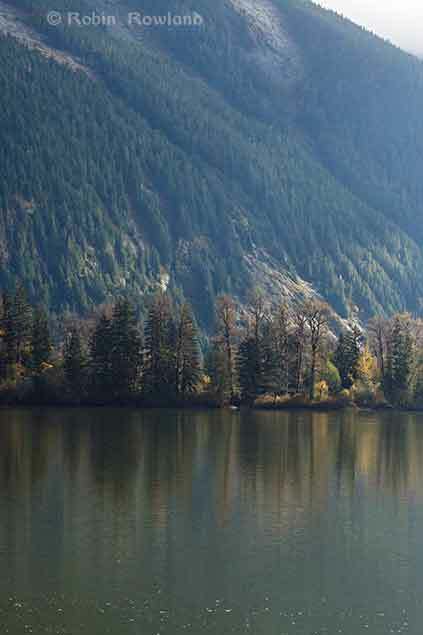 Far from the sea, a seal (front right) swims up the Skeena, Oct. 16, 2013. 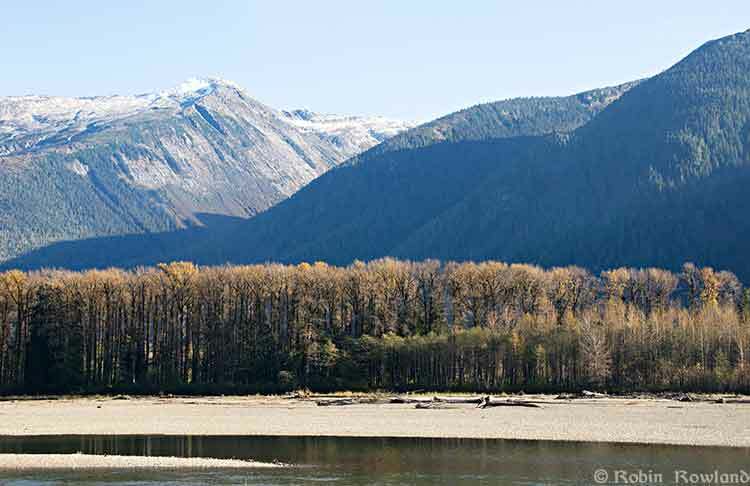 Bare black cottonwoods on a beach along the Skeena. 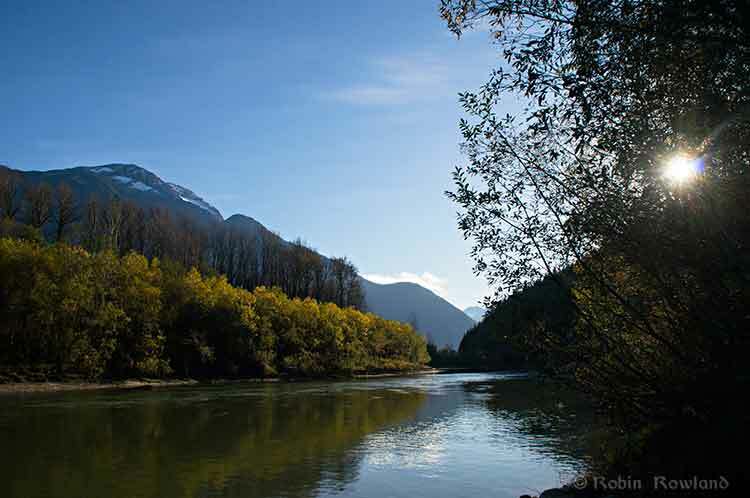 The sunsets on the Skeena near Terrace, BC, Oct. 16, 2013. 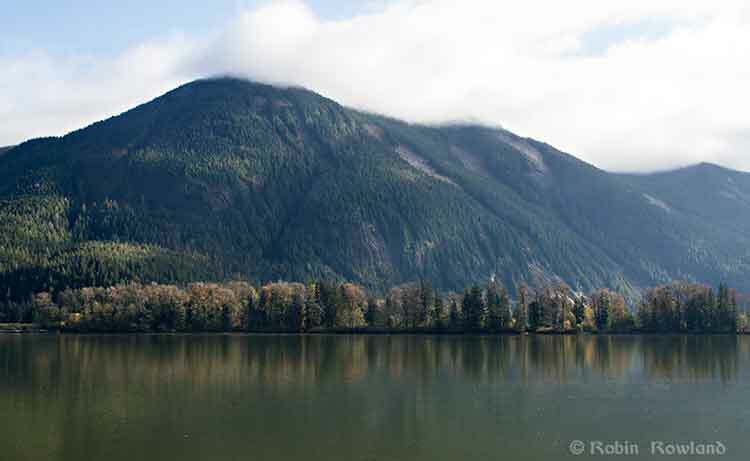 On Thursday, October 3, I drove to Prince Rupert for an appointment. 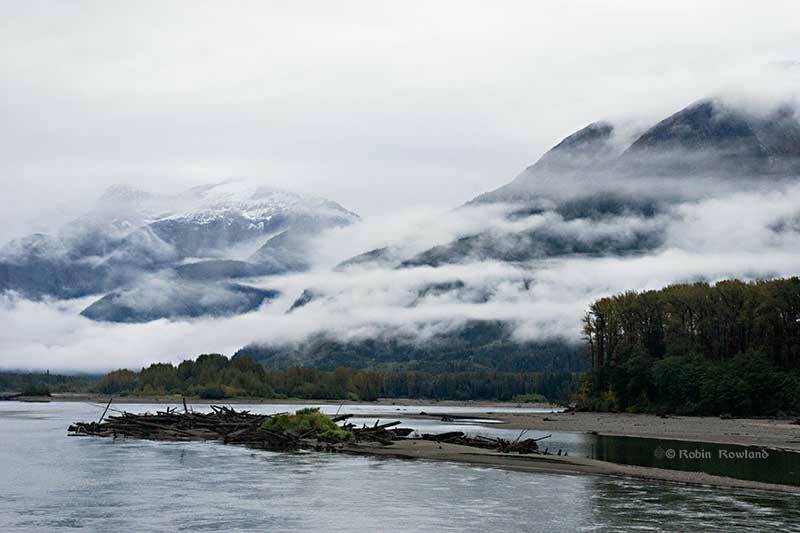 With heavy cloud cover on the way into to Rupert I didn’t get much of a chance to shoot the fall colours which are just beginning to peak on some parts of the Skeena (but not everywhere, due to micro-climates you can drive through bright yellows and then a few kilometres further on it’s all still green). 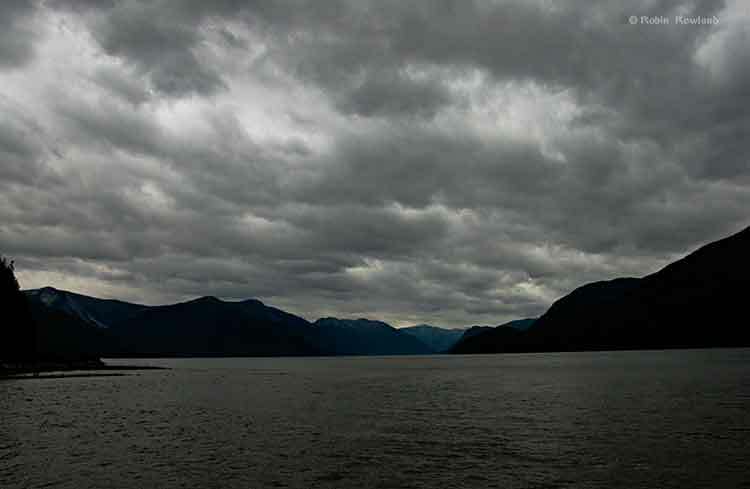 Appointment over and after a hearty seafood lunch at Cow Bay, I headed back to Kitimat, listening on the car radio to the storm warnings and wind warnings from Environment Canada for yet another major early fall storm approaching the BC coast. 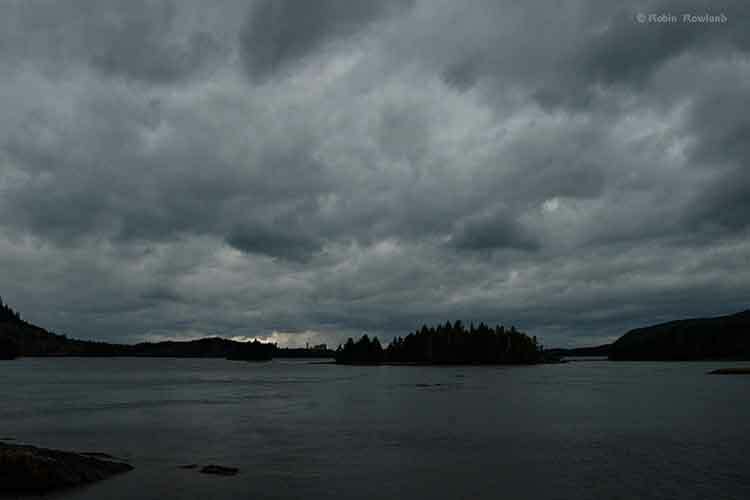 It was soon apparent from the darkening skies that you didn’t need an Environment Canada weather warning that a storm system was moving in. 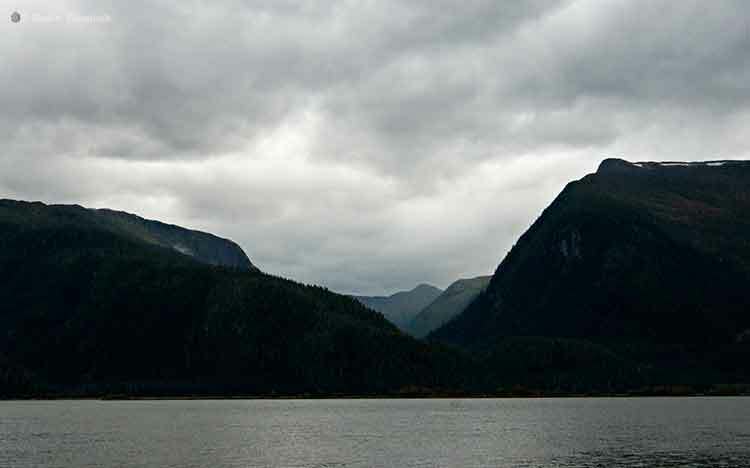 Prince Rupert is on the northwest corner of Kaien Island. Highway 16 skirts the the west end of the island until you come to the bridge to the mainland where the highway will either go east to Terrace or south to Port Edward. At the viewpoint just before the bridge, you could see the gathering storm. (By the way there was no rain at all during the time I was driving back and stopping at various points to shoot). 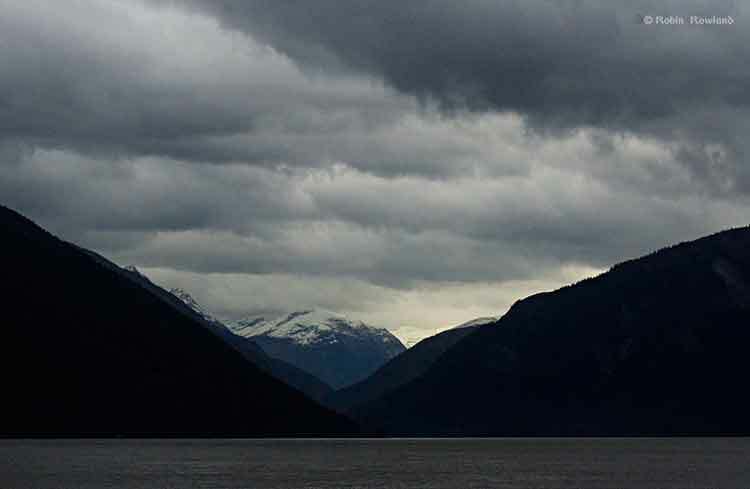 Just a few kilometres further on, despite the dark skies, the Skeena was flat calm. Those pictures in the next blog.